September and now October has flown past in a flash. What I thought was several more weeks to manage what's left in the garden turned into just a few days. The tomato plants were hit by blight, and I had just days to deal with what was left on the vines. 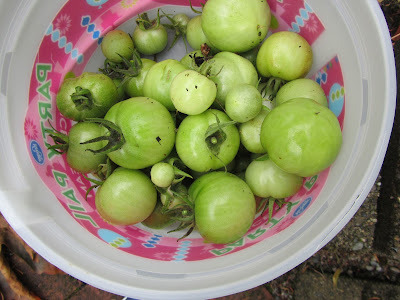 I went out to the garden on Monday, and I picked all of the small green tomatoes, even the ones that didn't have a chance at ripening indoors. Any tomato larger than a pea was fair game. After washing all of these tomatoes, I ran a bunch of them through the food processor, along with onions, and baby green peppers from the garden. I used this finely chopped veggie mix to make our sweet pickle relish for the next year. I used about 4 cups of chopped green tomato, 1 1/2 onions, chopped, and about 1/2 cup of finely chopped green pepper. Adding in some vinegar, sugar, salt and spices, I was able to make 3 pints of sweet relish, for about 50 cents total, including lids for the jars. This is enough relish for the year for our family, with a small jar leftover for gifting in a basket of home-canned goodies, to a certain someone, special to me. I have enough green tomatoes leftover to make a small batch of dill relish, too, if I work quickly. 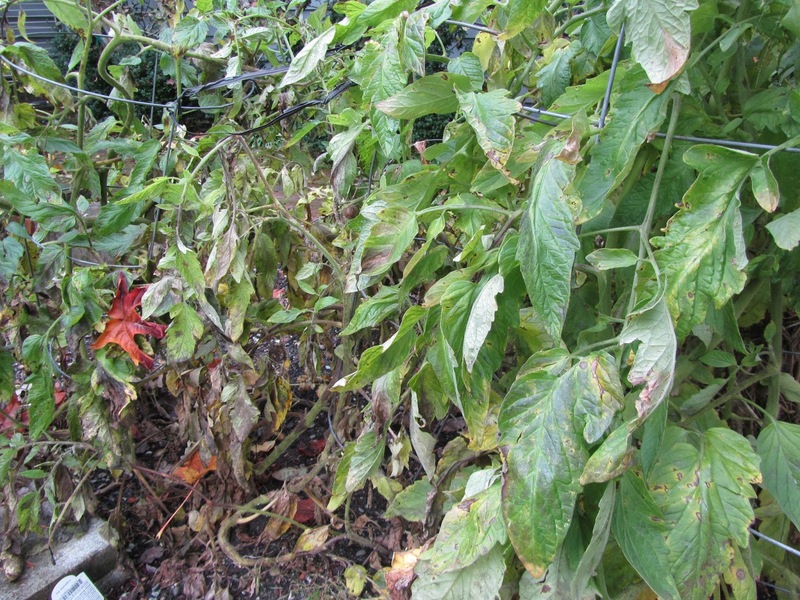 Once tomatoes have been caught out by blight, they turn brown and unusable. And so another summer's garden is coming to a close. A nice respite for me. And by spring, I'll be eager to get my hands in the dirt, once again. Making this relish reminded me of all of those end of the season recipes, like piccalilli, that I find in old cookbooks. Ones where you add bits of mis-matched this and that to the mix, and end up with something really yummy as a result. Have you ever tried piccalilli, or some similar garden relish? What do you do with those last bits from the garden? I like your sweet relish idea....I may have to try that. I have a green tomato pie recipe that I make in the fall. It may sound yucky but is like a mock apple pie. We like to can vegetable soup towards fall...using garden odds and ends. We pick our green tomatoes near frost time, wrap them individually in newspaper and put them in our unheated shop and usually eat ripe ones until after Thanksgiving. Frost time is about now each year. We gather as many peppers as will fit in our frig crisped drawer....they keep pretty well that way for us. Same with any cabbage as it gets to hard freeze time. Sometimes we try to put bales of straw around things and one on top and uncover during day to extend time also. We always are saddened to see the garden over.....but are oh so thankful for the abundance provided us. I made a sliced green tomato pie one year, and also a green pumpkin pie. Both were supposed to be like apple pie, inside of 2 crusts. We thought they were okay, but not our favorites. I also have a recipe for a green tomato "mincemeat" type of filling that I use in a bar cookie recipe. We like that one better. And green tomatoes are good added to spice cake, or chocolate-spice cake. Canning veggie soup sounds like a great way to use those odds and ends. Good job! And then later in winter you have this delicious, home-grown soup to enjoy. For many years, I kept our green tomatoes, much like you do, wrapped in newspaper and in a box in the garage. That works incredibly well. We don't have as many tomatoes these years, so I keep some in a bowl in the fridge and hold them over for a couple of weeks, and the rest are either in the pantry or on the counter, ripening. I will pick whatever we have left of the peppers, and keep in the fridge, like you said. It won't be much, but at least something, until I can use them. thanks! Lili, you just amaze me at all the things you do everyday. You have so many interesting things and enough to even blog about. I'm just intrigued. Those yummy bags of nuts are very creative. 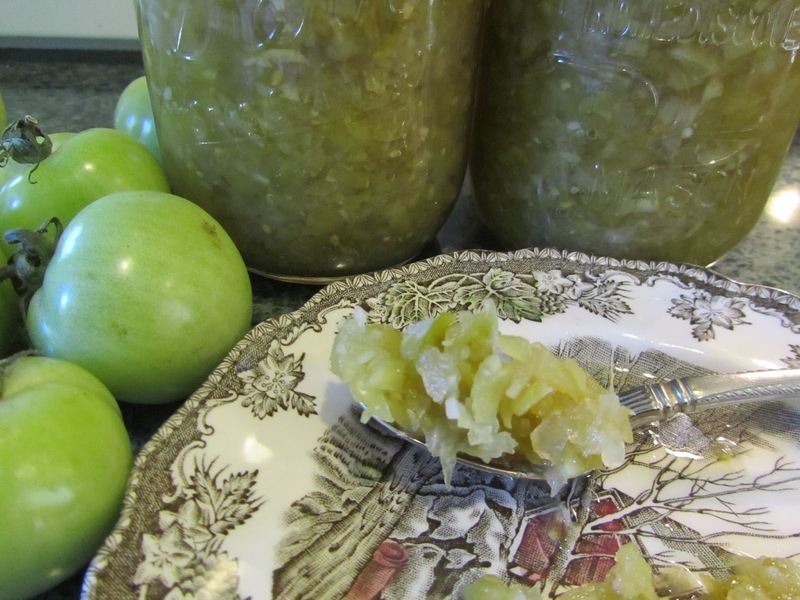 Green tomato relish. wow. My days are boring compared to yours. Yesterday, I put the hoses away after blowing the water out of them. I changed the broken brake light in my van and I made dinner after working all day. See how boring I am? I fit this all in two sentences. OK, now to give myself some credit. I used to do a whole lot more when we lived in a bigger home with a very large garden. I would can and freeze everything to cut my food budget down. Today, the kids are grown up, I moved to a smaller house with no garden and I don't have all those crazy busy things to do every evening. I like the slower paced life but I also know that if this world would take a nose-dive I would know how to start a garden again, I could preserve everything if I had to. 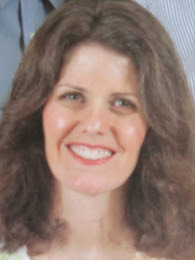 I'm just going to keep reading about all your excellent and creative homemaking ideas! It will keep me from not forgetting what we used to do. So tell me, how difficult was it to replace the brake light? Is it a matter of just plugging in a bulb, or do you have to twist any wires together? I have to do the same, and I've been putting it off, and even thinking to have the service place do it, when I take the car in for an oil change. But if you can do it, maybe I can, too. When I read you put the hoses away, I thought I read, your put the horses away! And I instantly thought, "Alice never mentioned a thing about keeping horses before!" But putting the hoses away is important work, too, and something I still need to do. Thanks for the reminder. You do a lot, Alice! You work full time and then come home and still do a whole lot more. So, definitely, give yourself some credit, here! And if you ever had to, I am positive that you could resume canning and keeping a garden. Plus, the bonus is, you raised your kids to know how to do those things, and there's a good chance that all of them will benefit from that knowledge and instruction. I'm just glad that you find what I blog about to be interesting! It was such a strange situation about the brake light. I thought it was my husband's van that had the brake light out. And then suddenly it was working again and I thought we had self-healing vehicles. My kids car also had "service engine" light on due to the gas cap not being fully sealed. It went off after a couple of week so we call it the self-healing vehicle. OK, back to the brake light--we use each other's vehicles interchangeably all the time so he must have been driving my van (in the dark) when I saw the brake light out. I never see my own brake lights because I'm behind the wheel. He was driving my van on Monday and the brake light was out and that's when I put it all together. OK, I asked hubby if he could do it but sometimes it takes him weeks and weeks so I google a youtube video on how to do it. It is pretty simple. Take two screws out (that's the hardest part because it needed allen wrenches not sockets) and then unsnap the light holder and determine which of the four needed to be replaced. Snap the old out and snap the new in. No wires involved for just the bulb and put it back together. Really easy. The only problem was it takes two people to test if the lights are working before you put it all together. Someone has to press the brake pedal to make sure the lights work so I snagged a neighbor kid to "pretend" he was driving and without keys in the ignition I let him hit the brakes. Thanks for your info, Alice. I think I can do this! ha ha, we have a lot of self-healing appliances, the vacuum being one of them! I have never had piccalilli, but I'm not a fan of spicy food, so I'm not sure if it would be my thing. However, I am a fan of fried green tomatoes which is what I think of for the end of season green tomatoes. Do you every make them? Or is that just a southern thing? I've done fried green tomatoes a few times. They are very delicious, and I have a hard time not eating them all, as I fry them. A couple of years, when I had more green tomatoes that I wanted, I fried a large batch, and froze on baking sheets. Then whenever we wanted some, I could reheat and crisp them in oven. Not as good as fresh, but still good. I think they're delicious, but I'm incredibly messy at the frying part. 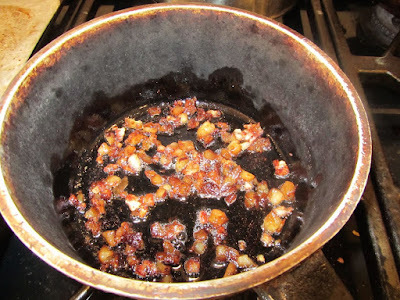 When I fry anything, oil gets onto every surface in the kitchen! Do you make fried green tomatoes? Do you like them, just as is, or do you put them in sandwiches? I had an excellent fried green tomato sandwich a couple of years ago, topped with cheese and some greens, on a chewy bun. Very good. I think they were, once, mostly a southern thing, but cuisine travels. My son eats from food trucks for lunch everyday, and the cuisines he tells me about are pretty interesting. have a great day, live and learn! oh, now that would be a great use for green tomatoes. If the tomatillo part of the recipe wasn't too large, I see tomatillos at the ethnic market for not too much per pound. I have more green tomatoes to use before the blight gets them. I'll look into some sort of picante sauce/salsa. thanks for the idea! I was intrigued when I saw it, too, and I don't recall it being a large investement of tomatillos. My thought was like Live and Learn's--fried green tomatoes. I haven't had them in forever, but I do enjoy them. I like your ideas of different relishes, too, to finish off the gardening season. Our garden seems to be slowing down, so I don't anticipate we will need to come up with creative ways to use up green tomatoes or other produce. It wasn't a great tomato year for us. Enjoy what's left of your garden! We'll be enjoying ours. Yummy Picalilli, I made some a few years back, still have some jars of it. Delicious! Yum! homemade picalilli. I'm sure you've enjoyed it! Oh that does sound tasty! I'll have to check out some recipes for salsa. I still have a few green tomatoes left.